Welcome on our web portal www.olomouc-guide.com. This portal focuses on the city of Olomouc, as well as the Olomouc region. 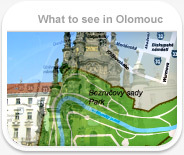 On www.olomouc-guide.com, you can book various kinds of tourist services, beginning with accommodation, through guided tours, excursions and transfers and finally also spa services. Our small, yet professional team provides individual and responsible approach to your requests, which enables us to make your stay as close to your ideas as possible. We will be glad if you contact us for advices, propositions and ideas before you visit our town. We can help you organize your journey effectively and trouble-free, no matter if you come as a tourist or for an important business meeting.